A German chef has blown off his hands while experimenting with a Heston Blumenthal-style cooking technique. One of the 24-year-old's hands was instantly torn off by the force of the blast, while the other was later amputated in hospital. The explosion happened at his girlfriend's mother's house in Stahnsdorf, near Berlin, where both women escaped without injury. The chef, a follower of "molecular gastronomy", had disappeared into the bathroom with a bottle of liquid nitrogen. He reportedly said afterwards he had been trying to fill a gas lighter but his 16-year-old girlfriend said he was attempting to empty the bottle. The young woman called the emergency services, who decided to airlift the chef to hospital in a helicopter. Liquid nitrogen is pure nitrogen at a very low temperature, which must be stored in special containers. Its low boiling point, at -196C, means it can cause frostbite in humans upon contact while it can also generate an explosion if the liquid is vaporised into gas too quickly. 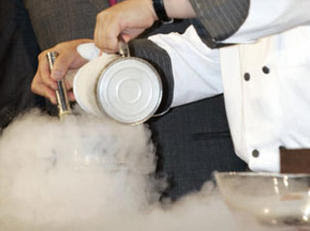 Cooking with liquid nitrogen was made famous by Blumenthal, the celebrity chef known for his scientific approach in the kitchen. Diners at his restaurant, The Fat Duck in Bray, Berkshire, are treated to a green tea and lime mousse poached at their table in the substance. Blumenthal also used liquid nitrogen to attempt to break the world record for making ice cream by using it as a coolant.